A massive seven-plex movie theater, to be called the Blackfoot Movie Mill, will open in June 2018 in the old Blackfoot Motors building on Bridge Street in Blackfoot. 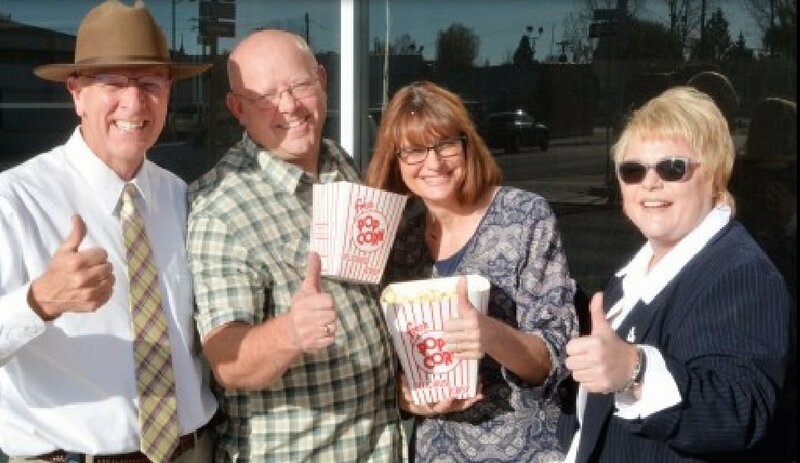 Making the announcement about the new cinema were Blackfoot Mayor Paul Loomis, Greater Blackfoot Area Chamber of Commerce Director Julie Ann Goodrich and Blackfoot Movie Mill owners Kent and Ingrid Lott. BLACKFOOT — The Greater Blackfoot Area Chamber of Commerce in conjunction with Mayor Paul Loomis are pleased to announce that Kent and Ingrid Lott, owners of the Blackfoot Movie Mill, will be opening a new seven-plex movie theatre in the old Blackfoot Motors building on Bridge Street in June 2018. This has been a collaborative partnership between the Greater Blackfoot Area Chamber of Commerce, Mayor Loomis, City Economic Development Director Kurt Hibbert, Bingham County and the regional economic development organization REDI. The Blackfoot Movie Mill will show first run movies offering adult tickets at $7.00 and matinee, child, and senior tickets at $5.00. Concession prices are going to be much lower than other establishments, with combo prices (2 drinks and popcorn) being about the same price as a single drink at other establishments. This price matrix will make the Blackfoot Movie Mill the destination venue of choice for entertainment in our region. This theatre in Blackfoot will sport cutting edge laser projection technology, which provides a significantly brighter and clearer picture than traditional theatres, surround sound, stadium seating, family atmosphere, and offer kid friendly summer-programs as well as accommodate corporate and business use of the facilities. With this new development project, chain eateries that have previously discussed starting up in Blackfoot, have renewed interest and are planning on locating in this new “entertainment district” creating an eat, play, and stay destination environment in the City.